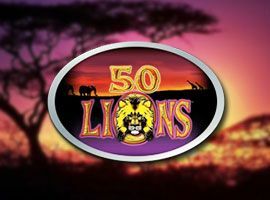 People who like animals will definitely love 50 Lions slot, as this game takes you on a trip to Africa, even though you don’t have to leave your house. The five reels are full of animals from the African continent, such as lions, zebras, elephants and giraffes. To convince you to try this machine’s features, many online casinos offer you bonuses such as welcome packages, cash back or even free spins. Apart from the colorful and vivid graphics, this slot machine also offers people a relaxing sound scheme and lots of features which give them the possibility to win some money in an enjoyable way. It has 5 reels with four symbols each and a total of 50 paylines which make it easy for lucky players to win. Also, there’s a scatter included, making it possible for bettors to trigger free spins that allow them to win prizes at no cost. Each slot machine functions based on a random number generator, meaning that there is basically no way a person can change the outcome of a spin. Although you cannot control the results of 50 Lions slot’s reels, there are some tricks you can use to win more. The easiest way to get more prizes from this game is to play it for free for as long as possible. Our website allows you to spin the reels of this slot without making a deposit or even creating an account, so you can play it for free for an unlimited period. Playing a game without investing any money helps you learn everything about its features and hidden secrets and create strategies that will bring you closer to big wins. Whenever you feel prepared, you can choose a casino and start playing 50 Lions for real money.